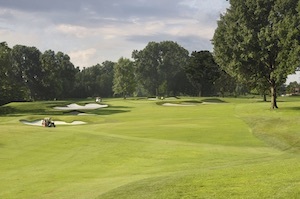 Fry/Straka Global Golf Course Design, an award-winning golf course design partnership with worldwide reach, is set to renovate the William Diddel designed, Kenwood Country Club’s Kendale Course, located in Cincinnati, Ohio. With overwhelming support from the club’s membership, construction is slated to begin in August of 2019, with a reopening target of late spring, 2020. This historic club was founded in 1929 by 11 members of the Cincinnati area. William H. Diddel, a founding member of the American Society of Golf Course Architect’s, was commissioned to design the 36-hole facility which opened in August, 1930. Having hosted the 1933 U.S. Amateur, the 1954 Western Open and the 1963 U.S. Women’s Open, Kenwood looks to make significant upgrades and continue with their tradition of golfing excellence. Fry/Straka will focus on restoring the club’s original Diddel design with consideration for today’s golfing and maintenance technology. Greens will be restored to original size and contours, but will be softened to also capture original pin positions rendered unusable by today’s green speeds. The project also includes a restoration of bunkers and widening of fairways to recapture original widths. Additionally, considerable tree management will be undertaken with an emphasis on improved drainage throughout the property. Wadsworth Golf Construction and All Green Irrigation have been selected to build the Fry/Straka – Mike Kuhn (irrigation) improvements, along with considerable support from Golf Course Superintendent, Kent Turner and his talented maintenance staff.